Camilla & Marc takes on the little black dress with their signature tailored style. Crafted in matte black, it sculpts the body beautifully and features a statement side split. 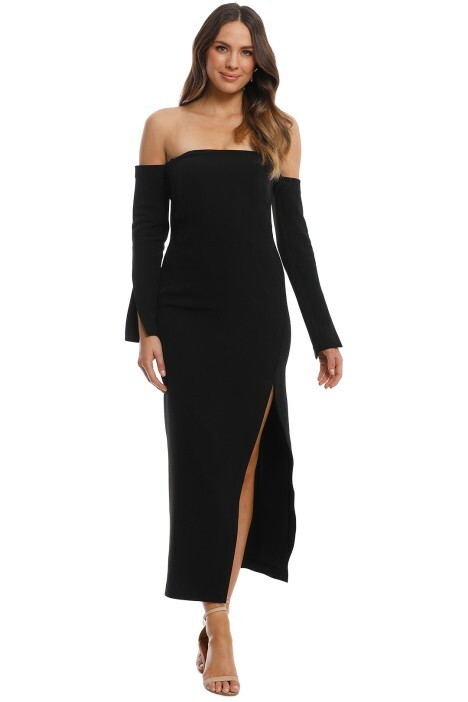 The off-shoulder neckline drops into long sleeves that exquisitely balance the column midi skirt. Make it yours to rent for an elegant cocktail party or evening soiree. Channel sophistication with gold jewellery and a slender black heel. Pull your hair into a sleek low ponytail and hire a leather pouch to keep your essentials close by. To add a little drama, rock your favourite red lip. Read our blog post for more tips on what to wear with a little black dress. LENGTH: This dress is a long midi length. Twiggy Off Shoulder Dress is rated 4.8 out of 5 by 6. Rated 5 out of 5 by Bre from Great for any event! I rented this for a gala evening, the dress was comfortable and the fit was beautiful. I had compliments on my outfit all night! Rated 5 out of 5 by BT from Wedding Guest Dress Rented this dress for a wedding with a formal dress code. It was elegant yet still maintained a fun, modern vibe with the sleeves and side split. I am usually a size 10 and it fit well enough, but could've gone a size down (8) noting the sleeveless style! My bad.... Lucky the dress had the quality boning and structure to it so it held up. I recommend this dress! Rated 5 out of 5 by Germ from Wore this to a family wedding The dress came in perfect condition and was so comfortable to wear all day and night! Rated 4 out of 5 by Kellie Kennedy from Dress for charity ball I rented this drsss and it’s beautiful but C&M is a bigger make I feel it would have fitted better in a size 8!